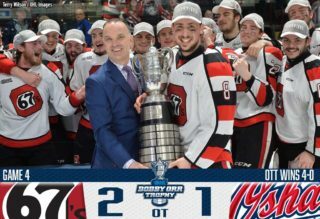 Kyle Maksimovich (28) scored the overtime winner with 51 seconds left in the extra frame, giving the Ottawa 67’s a 4-3 win over visiting Guelph. Mitchell Hoelscher (10), Marco Rossi (24) and Noel Hoefenmayer (13) also scored for the 67’s while Tye Felhaber finished with a pair of assists. Lucas Chiodo and Sasha Chmelevski gathered assists on Maksimovich’s winner as the 67’s struck back against the Storm who they lost to by a score of 8-4 back on Jan. 13th. Keegan Stevenson (16, 17) scored a pair of Guelph goals before Nick Suzuki (26) knotted the score at three with 3:08 remaining in the third period to force overtime. 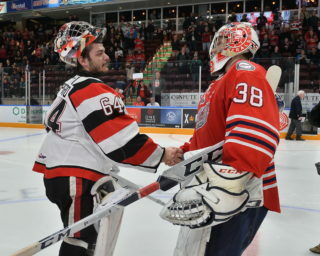 Michael DiPietro made 30 saves for the win while Guelph’s Anthony Popovich was kept busy, making 38 saves as his team earned a point in the OT loss. Ottawa outshot Guelph 42-33, going 2-for-3 on the power play while also extending their current winning streak to seven games. The Storm falls to 26-13-6-4, four points back of third place Saginaw in the Western Conference. The 67’s improve to 37-9-3-1, leading second place Niagara by seven points atop the Eastern Conference. Jason Willms (10) tied the score at two with 19 seconds left in the third period but the London Knights would prevail on a Connor McMichael (31) shootout winner for a 3-2 win over the Barrie Colts on home ice. McMichael and Kevin Hancock (39) scored London goals as the Knights heavily outshot Barrie 52-26. Colts rookie Jet Greaves was tremendous, turning in a 50-save performance to help his team earn a point while Jacob Tortora (13) joined Willms on the scoresheet for Barrie. London’s Joseph Raaymakers picked up the win in goal, making 24 saves to climb to 24-4-3-1 on the season. London earns a fifth straight win, improving to 35-7-5-1 while Barrie drops its eighth in the past 10 outings, falling to 20-25-2-1. First period goals from Alex Johnston (7) and Cole MacKay (18) gave the Soo Greyhounds they needed to get past the Erie Otters by a score of 4-1 on the road. The Hounds rebounded from a lopsided Thursday night loss in Niagara as Morgan Frost (32) and Barrett Hayton (19) also found the back of the net while Sault Ste. Marie outshot Erie 31-25. Rookie netminder Ethan Taylor made 24 saves for the Greyhounds, surrendering Erie’s lone goal off the stick of rookie Brendan Sellan (3). The Greyhounds get back in the win column, improving to 32-11-5-1 while Erie falls to 19-27-1-1. 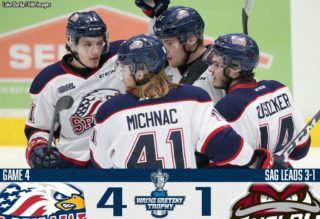 The Saginaw Spirit improved to 6-0 against the Flint Firebirds this season, taking a 4-2 road win behind a first star performance from rookie forward Camaryn Baber (4). Baber finished with a goal and an assist while Cole Perfetti (21), Justin Murray (10) and DJ Busdeker (12) scored first period goals to put the Spirit in the lead 3-0. Perfetti’s penalty shot goal 4:08 into the first period was his 21st of the season, the most by a 16-year-old rookie in Spirit history. Arizona Coyotes prospect Ivan Prosvetov made 33 saves for the win as Flint goals came from Ethan Keppen (18) and Jack Wismer (11). Saginaw shakes consecutive losses, improving to 31-14-2-2 to remain within four points of first place Sault Ste. Marie in the West Division. Flint drops a thirds straight decision, falling to 9-39-3-0. Dallas Stars prospect Jason Robertson (36, 37) enjoyed a valiant return to Kingston, scoring twice while adding two assists in a 5-1 Niagara IceDogs road win over the Frontenacs. Robertson’s tenth 4+ point contest of the season powered an eighth straight win for the IceDogs as they outshot the Frontenacs 36-19. 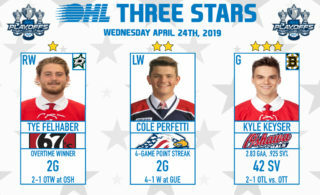 OHL Co-Players of the Month for January Akil Thomas And Ben Jones each had two assists while Oliver Castleman (15), Jack Studnicka (20) and Kirill Maksimov (31) also found the back of the net. Niagara went 3-for-5 on the power play while rookie goaltender Christian Sbaraglia made 18 saves for his second win of the season. Nick Wong (7) opened the scoring 2:20 into the first period and that’s all the offence the Frontenacs could muster as they suffered their seventh straight loss, falling to 12-37-1-0. Niagara continues to lead the Central Division owning a 32-10-7-0 record. Newly minted captain Rickard Hugg (20, 21, 22) came up with his second hat-trick of the season as the Kitchener Rangers ran wild on the visiting Owen Sound Attack in a 6-1 win. Kitchener’s third straight victory saw Luke Richardson come within 1:53 of a shutout, turning aside 34 of 35 while Riley Damiani (19) pieced together his second straight four-point game with a goal and three assists. Isaac Langdon (5) and Joseph Garreffa (15) also contributed on the scoresheet as the Rangers won despite being outshot 35-31. Adam McMaster (14) ended Richardson’s shutout bid late in the third, providing Owen Sound’s lone marker on an otherwise disappointing night. The Attack have now lost eight of the last 10, falling to 23-22-2-2 while Kitchener improves to 23-22-3-0 and pulls into a sixth place tie with Sarnia in the Western Conference. The Oshawa Generals and Peterborough Petes combined for 18 goals from 16 different scorers as the host Generals took a 12-6 win following a five-goal third period. The game featured a little bit of everything including power play goals, shorthanded markers and some late extracurriculars as Oshawa scored 12 times on 46 shots, going 5-for-6 on the man advantage. Brett Neumann (32, 33) and Tyler Tullio (11) each had four point nights for Oshawa while Allan McShane (21, 22) also scored twice. Dylan Robinson (2), Nando Eggenberger (17), Danil Antropov (12), Brandon Saigeon (30) and Anthony Salinitri (38) also found the back of the net for the Generals. Chad Denault (6), Liam Kirk (17), Semyon Der-Arguchintsev (6), Adam Timleck (18), Zach Gallant (6) and Nick Robertson (18) responded with goals for Peterborough. Oshawa snaps a three-game skid, improving to 29-18-2-0 for fourth in the Eastern Conference while Peterborough falls to 24-23-1-1. The Generals have won four of six meetings against the Petes this season. The two teams meet again on Saturday in Peterborough. The Mississauga Steelheads overcame a 3-1 deficit as Alan Lyszczarczyk (26, 27) scored the game winner and added insurance in a 6-3 win over the visiting North Bay Battalion. Sophomore forwards Cole Schwindt (14) and Keean Washkurak (10) also chipped in, with Schwindt recording a goal and an assist while Washkurak finished with a goal and two helpers. Adam Varga (4) and Nick Isaacson (9) also got in on the Mississauga scoring while defenceman Ryan Barbosa picked up two assists. Mississauga outshot North Bay 47-29 and went 2-for-3 on the power play. Justin Brazeau (44), Mitchell Russell (9) and Matthew Struthers (22) all scored for the Battalion while Christian Propp made 41 saves in the loss. Mississauga’s Jacob Ingham returned to the crease after missing last weekend’s action, getting the win with a 26-save effort. Mississauga climbs into sole possession of fifth in the Eastern Conference with a 23-20-5-1 record while North Bay slips to 23-24-1-2 for eighth in the conference. The Sudbury Wolves took it to the Windsor Spitfires, outshooting them 46-23 in a 4-1 win on home ice. Darian Pilon (12), Shane Bulitka (14), Quinton Byfield (18) and Nolan Hutcheson (16) all scored for the Wolves while Adam Ruzicka collected a pair of assists and Ukko-Pekka Luukkonen made 22 saves. Windsor’s Tyler Angle (14) broke up Luukkonen’s shutout bid midway through the third period on the power play. Sudbury earns a fourth straight win to improve to 29-16-2-1 for third in the Eastern Conference. Windsor falls to 21-27-2-1 but remains five points up on ninth place Erie in the Western Conference.